200 pages | 37 B/W Illus. 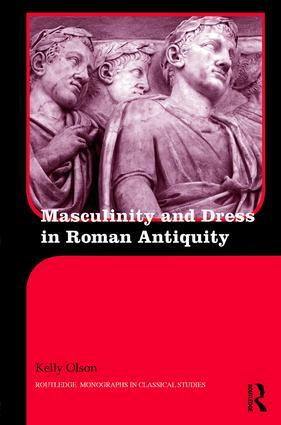 In Masculinity and Dress in Roman Antiquity, Olson argues that clothing functioned as part of the process of communication by which elite male influence, masculinity, and sexuality were made known and acknowledged, and furthermore that these concepts interconnected in socially significant ways. This volume also sets out the details of masculine dress from literary and artistic evidence and the connection of clothing to rank, status, and ritual. This is the first monograph in English to draw together the myriad evidence for male dress in the Roman world, and examine it as evidence for men’s self-presentation, status, and social convention. With her customary insight and remarkable clarity Kelly Olson, in her Masculinity and Dress in Roman Antiquity, offers a rich and fascinating exploration of a key aspect of the language of clothing in Classical antiquity. With an eye to unexpected ancient sources, and even to the bizarre, Olson explores what it meant to be a man in Roman society and how dress confirmed, stressed or undercut the core values of masculinity. Olson is a leading scholar of ancient dress studies and this latest work confirms her reputation for excellence. Kelly Olson is Associate Professor of Classics at the University of Western Ontario, Canada. Her other works include Dress and the Roman Woman (Routledge, 2008).